Browse through a large number of Haunted Houses and other Haunted Places in Pennsylvania. Each year we bring you the scariest places in Pennsylvania! Find a Haunted House in Pennsylvania and get your scare on! Field of Screams in Mountville, Pennsylvania, has three terrifying attractions for a non-stop adventure you will never forget. A 160-year-old barn is home to the Den of Darkness and its grotesque inhabitants. Built during the 1800s, the barn was converted into a farmhouse, and then a hotel. Tragically, over 100 guests of the hotel perished in a fire that left their anguished souls behind. Three floors of dark halls and narrow passageways accommodate the many occupants as their shrieks of terror harass you on your journey. Be forewarned- they want your soul to stay forever, too. Only the bravest will escape The Den of Darkness. The Frightmare Asylum is housed inside the Applegate Mental Institution, a leading research facility that prevailed in the early 1900s. It is four stories of sheer terror as the demented ghosts of psychotic patients and disturbed doctors torture you with their deranged minds and twisted experiments. Movie-quality scenes and cutting-edge special effects add to the horror you will experience. Checking in is easy; visitors become trapped in the mind-altering, bone-chilling torment inside the walls of The Frightmare Asylum. Checking out is another story. Once you embark on The Haunted Hayride, there is no turning back. Deep inside the Field of Screams cornfield, your worst nightmares spring to life amidst the tall, dark, swaying rows of corn. You will stumble upon numerous torture devices so heinous they are seemingly ripped from the Dark Ages. See why the Field’s residents enjoy when misfortunate visitors trespass on their camp. What happens when Rednecks mix gas, guns, and fire? You will discover the answer first-hand. Lethal arcs of electricity from a giant Tesla coil will astound you as you pass just inches from the lightning. As you creep by the threatening voltage, will you fall prey as the next experiment victim? Experience the Chill of Field of Screams, where terror stalks methodically in search of random victims. Are you strong enough to survive? Arasapha Farms Haunted Hayride and Bates Motel in Glen Mills, Pennsylvania just outside of Philadelphia, was rated the #1 haunted Attraction for 2010 and 2011 by USA Today, featured on the Travel Channel, and considered one of the best haunted attractions in America and haunted houses in Philadelphia. Featuring multiple attractions, the Arasapha Farm Haunted Hayride and Bates Motel Philadelphia haunted house are easy to check in, but not so easy to check out. The Haunted Hayride is the only attraction that welcomes all ages. For over 20 years the hayride has been amazing visitors with their state-of-the-art props and digital FX, professional actors and incredible makeup and costumes. The hayride is a 25 minute ride through the dark forest of Arasapha Farm. This action packed, heart pounding ride is filled with amazingly detailed sets, monsters, fire, and more. Bates Motel is the most incredible haunted house with special effects, digital sound and lights like you have never seen before. 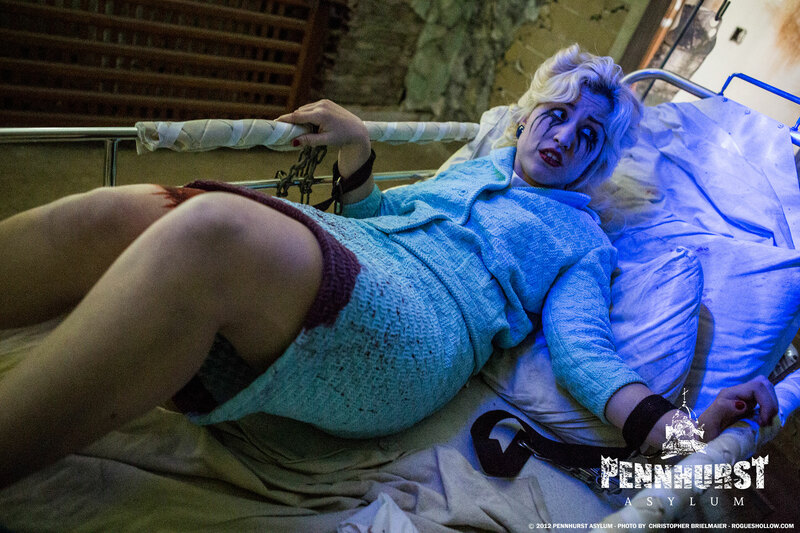 Up close and personal, the Bates Motel inhabitants will terrorize even the most experienced haunted enthusiast. The Bates Motel is a high startle, action packed event not recommended for young children. The Haunted Corn Trail is a terrifying walk through show with buildings and sets unique to the industry. Incredible animatronic monsters will keep you guessing whether they are man or machine. A High tech event, the Haunted Corn Trail has more intense, creepy scares, and, once inside you will agree that the Haunted Corn Trail is equivocally the best haunted corn maze in the country. Now entering our 27th year Jason's Woods Haunted Attraction in Lancaster, Pennsylvania is a must see to believe multiple haunted house attraction. Featuring 5 full length attractions and 2 complimentary mazes this extraordinary mix of actors, cutting edge animation, insane special effects and sound will exceed your expectations! Do you dare to challenge the new Horrifying Hayride where bizarre mayhem and a host of degenerate junkyard creatures are waiting for you! Beware for this is not the first time they have hunted human! Will you survive The Barn of Terror, when you’re worst nightmares come to life, and you are forced to choose between escape and certain doom? Experience the Pirate’s Revenge, in senses shattering 3-D, where you can hunt for the lost Zombie Pirate treasure chest but beware of the consequences of finding it! Find yourself Lost in Jason’s Woods, where the bloodthirsty werewolves look for warm flesh to satisfy their insatiable hunger. Follow your trusted guide into the entrance of their forbidden cave for a narrow escape or spend the rest of your days disoriented, wandering the dense, unforgiving forest forever searching…. The new Carnival of Fear houses our insane clowns who feed on your screams and want nothing more than to add you to the collection of lost souls trapped under the ominous shadow of the Big Top. Enjoy a walk through the Mystery Maze. While you stumble along finding your way among the dead ends and wrong turns you are being watched by infamous, calculating, villains who have forever to stalk their prey. Reunions with the claws and knives of old friends await… The lights of the enormous 1930's style theatre beckon you to enter into a new world of illusion and fear, The Grand Theatre Experience at Jason’s Woods! Feel your sanity slip away, as you are transported to a world where haunted attraction meets film for an experience like no other. Are you the lead role or just another helpless victim? If you think you’ve seen it all, think again! No one does Halloween like The New Jason’s Woods 2012! HorrorFest at Shady Brook Farm In a dark corner of historic Bucks County, PA awaits HorrorFest at Shady Brook Farm, a short drive from New Jersey, New York, Delaware, and Maryland. 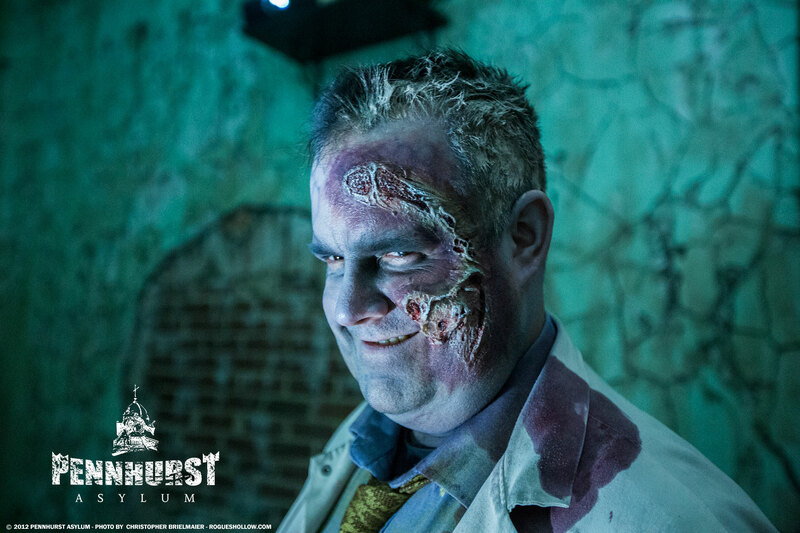 HorrorFest features four thrilling attractions: the Hayride of Horror, Barn of Horror, 3-D Alien Encounter, and Carnage. Take a creepy wagon ride through the deep, dark woods on the Hayride of Horror and encounter spine-tingling fun along the way. Braver souls will want to try the Barn of Horror where terrifying ghouls and goblins lurk around every corner, trying to keep their visitors from ever leaving again. Step into the 3D Alien Encounter and step outside of the realm of reality. Experience a mind-bending, extraterrestrial adventure that is out of this world. Enter Carnage, where all of your favorite childhood stories are turned into bloody nightmares. Wind your way through this scary corn maze and encounter your worst dreams face to face. Shady Brook Farm has spent decades sowing fear. Come reap the terror lying in its fields. Can you handle the harvest? Lu Lu’s House of Horrors in Plymouth Meeting, Pennsylvania, is voted the weirdest and most bizarre haunted house. Board a creaky wagon and be transported through the haunted woods to the deadly graveyard where you can find your way to the 200 year old house of horrors. Dare to enter the house for some old fashioned style haunted house scares. Survive the assortment of creepy things, monsters, wolves and electrocutions only to enter the corn maze to complete the mayhem. Looking for a weird and bizarre time, come to Lulu’s House of Horrors and leave fulfilled. Demon House in Monongahela, Pennsylvania is a genuine 100-year old haunted stone mansion. Creepy now, instead of a line, you get a number and are able to wander the grounds of this evil, expansive house of evil. Enjoy the heat of the bonfire and comfort of the picnic table until you can work up the courage to enter the Demon House. The mansion has held many secrets of the past including the fact that the mansion sits upon the burial ground of over 70 unmarked graves. When unearthed, these souls unleashed evil on the land and in the Demon House. It is believed a woman named Carla who lived in the home was an evil witch. People came from worlds away to have her heal what ails them and demon possessed souls. Eventually Carla and a child named Liam disappeared. The sheriff went inside and what he saw in the basement was horrifying. Returning to do an investigation, seven men went into the house. None of these men ever came out and no one was ever seen at the house again. It remained empty until 2004 when it was opened to the public for viewing as the Demon House. Are you brave enough to see what is inside? The ScareHouse is Pittsburgh’s Ultimate Haunted House on the western side of Pennsylvania. Pittsburgh is a short trip from Ohio, and located just 2 hours from Cleveland. Voted one of America’s Scariest Halloween Attractions by Travel Channel, (one of) The Scariest Haunted Houses in America by USA Today, Forbes, Fangoria, and Haunted Attraction Magazine. The Scarehouse features three haunts for one price. Forsaken takes you into an abandoned house filled with damned souls. No happiness is found in this death trap of insanity. Your brain may never be the same after you enter a demented 3-D journey into your worst nightmares. Pittsburgh Zombies is a tribute to our city’s living dead legacy as Zombie Capital of the World. Enter a real life Walking Dead Apocalypse into one of America’s Best Haunted Houses: The ScareHouse! Haunted House in the Hollow, Sleepy Hollow Hayride in Newtown, Pennsylvania - The House in the Hollow is a ghost story come to life. Known for High Tech effects, it is run by Theater people but, only ghosts inhabit it today. Malfate Manor, its tragic history began with the Malfate family who originally built the now haunted mansion with seventeen rooms, including the cellars with see-through ghosts appearing and vanishing before your eyes. The ancient graveyard beside the house is choked in perpetual fog, and is the only way out. Since then it has been used as a hotel, a funeral parlor, and even was an asylum for a few years. In every case disaster struck. Sleepy Hollow Hayride will take you into the hollow for a 1¼-mile excursion past deserted farm buildings and through acres of woods, fields and the farm cemetery. Keep your eyes open. The cornfields and autumn foliage--so beautiful by day--have an unsettling eeriness at night. Especially when walking through the large Field of Fright. We dare not mention the many horrors that been reported by those who return. Beware of the headless horseman if you hear the hooves of his horse approaching the wagon. It has been said the ghost of Krazy Karl still drives the old farm combine. Be sure to keep your loved ones close to you at all times. The Haunting at the Waldorf: Fright Nites are back at The Country Junction featuring The Haunting at the Waldorf Hotel!! That’s right, all the terror that is the Waldorf Hotel has found a new home on Rt. 209, Interchange Rd in Lehighton, PA with three all new haunts. Come face to face with your worst nightmares on Terror in the Corn Haunted Hayride. Think your safe ‘cause you’re tucked in that wagon, think again! If the corn decides to keep you there’s no escape!! Want some more…then try to survive the Zombie Apocalypse!! It’s the end of the world and all that’s left are you and the walkers. Find your way to the safe zone or get turned into the undead yourself. Scared yet? The Waldorf Hotel is still waiting, calling for you to come in. You see the hotel is filled with the souls of the dead, restless and looking for revenge on all who dare to enter. Will you escape the horror within or will your soul get added to its collection. Enter to find out, we dare you!!! Spook Haven Haunted House in Lock Haven Pennsylvania is the most unusual haunted attraction in the Valley. With the wicked history of the land, house and factory Spookhaven has become a portal of evil. Many stories have been told of the “Death Marsh” where scalped souls wander the land in search of solace from the evil of the brutal frontier life. Through the industrialization of Pennsylvania, although the land was cursed, a wealthy man purchased this land and built a factory and mansion, to flaunt his wealth. Unusual unexplained occurrences haunted the workers at the factory. Visions of Indians walking through the factory, whistling sounds from an employee who perished, and sounds of footsteps when no one was there, made them uneasy. Death from freak accidents occurred weekly. High production and seven days a week hours drove the employees into a crazy mayhem and brought them to an unusual brutality to the owner and his family. Neither the employees nor the family were found alive. Shocktoberfest located about an hour west of Philadelphia in Reading is Pennsylvania's Premier Haunted Theme Park. Your fear of The Unknown will tantalize your every sense. Are you afraid of the dark or small tight spaces, snakes or spiders, water or fire, The Unknown will find your fear and exploit your senses. This sci-fi journey will overwhelm your every sense with never-seen-before computer controlled 3D video, animatronics, lights and sound effects, and over 20 years of industry experience for a thrill like no other. Welcome to the Willow Glen State Penitentiary or Prison of the Dead. This, now condemned, prison allows you to view the mistreatment and inhumane torture experienced by the souls who are trapped within the walls. Souls seeking revenge on the guards and warden may mistake you for one of them, so beware, if caught your sentence will be death. Take a tour through the industrial park we call BioHazard Haunted Hayride. Rumors said that this area is dormant due to zombies whom have decided to make this their home. Enjoy a night out of dancing with Ghouls Gone Wild at Club Shock. Today’s hottest music is for everyone over 15 years old as no spirits are served, but guys and ghouls have a blast. Hungry for more, join us at Monster Midway for a burger and fries, funnel cake or steak sandwich. Enjoy games of skill and chance. Just remember, no place is safe at Shocktoberfest! Haunted Hills Estates is located in Uniontown, Pennsylvania just a short drive from Pittsburgh, Pennsylvania and Morgantown, West Virginia. The Haunted Adventures at The Haunted Hills Estates begins on the spooky streets to the three adventures. Enjoy one, two, or all three adventures through the Haunted Hills Estates. Challenge Trail will test your crew as you descend into the haunted woods for a pirate’s voyage with a treasure map and the challenges set forth. You begin at the Pirate Skull entrance for a test of courage and crew. Try to navigate, twist and turn your way through Legends. The barn that is over 200 years old holds the evils of histories past. Where will you turn, be careful where you run. Uninvited guests are displayed for your warning of what is to come, when you are not welcome. Don’t be too concerned, we have an Emergency Medical Team waiting for you in the end where shots are free and the nurses can really wrap. Only the bravest can navigate The Chamber of Chills. Can you find your way through the chambers of the 7 deadly sins and make it to the 8th? Will you find the last chamber or fall victim to the horrifying wicked adventure through The Chamber of Chills. Don’t wait for a review, challenge your own fears and test those of your friends and family. Whatever you do don’t come alone for this adventure will have you screaming for more. Hotel of Horror is located in Saylorsburg, Pennsylvania. This seemingly small quaint town in the Pocono Mountains holds the most gruesome secrets and welcomes you to experience the Horror of this centuries old mountain resorts history. The Legendary Abandoned Lake House Hotel houses three state of the art attractions which will blow you away. Check in is easy, but the rest will take you on a journey through the process of dying and afterlife. We welcome you to The Burial Below for an experience you will not forget. The Hotel of Horror houses a portal to the evils from hell and is a haunted house which has been able to harness the evils during the year. Once the chill in the air and the harvest begin, the evil energy can no longer be contained. Enter The Doll House for your childhood nightmares come to life, your fears of years ago will return for the most tormenting challenge to your visions of the evils of childhood altered nightmares. The Exhibition Macabre is open for viewing the historical experimentation displays of the realities of our horrific past. The medical devices, preparation for the deceased, and memorialization of life during the darkest hours will bring the reality of the most horrific and sinister facts of history to reality. Some say all publicity is good publicity. Randy Bates, managing partner of the new Pennhurst Haunted Attraction in Spring City, Penn., and owner of the Bates Motel and Haunted Hayride in Glen Mills, Penn., would agree. As Bates and his partners and staff prepared to open Pennhurst to the public as a haunted attraction in fall 2010, Bates and Pennhurst received a media firestorm. Pennhurst, for­merly known as the Pennhurst State Home and Hospital, which originally opened in 1908 as a 120-acre campus for people with physical and developmental disabilities and closed in 1987 due to allegations of abuse to residents, was about to open to the public for the first time in more than 20 years. Neighbors complained and attacked the attraction’s zoning ordinance, filing a law suit to try to keep Pennhurst closed. Other community members riled the disabilities community, alleging that Bates’ plan was to make fun of children with disabilities. Local newspapers and even national news outlets picked up the stories. Bates took a beating. He was criticized by com­munity members repeatedly. “It’s kind of tough seeing your name in the newspaper and having people demonize you and call you a bad person for doing what you’re doing,” Bates says. Fortunately for Bates and his partners and team, criticizers, although loud, were small in number. Most of the community, including the local government, was in support of giving Pennhurst a new lease on life. And the media wanted to be part of the excitement. “On our first opening night, ABC, NBC, CBS, and Fox news broadcast live in front of the haunted house,” says Bates. That night, the ABC affiliate, which Bates says is probably the top local news station in Philadelphia, had as their breaking news that after being closed for 20-some years, Pennhurst opened as a haunted attraction. Bates and his team got lucky, but not without a lot of hard work and due diligence done from the start. Before dreaming up scares for a new haunt and dividing his time between the Bates Motel and Haunted Hayride and this new venture, Bates and his Pennhurst Haunted Attraction partners had to make sure their idea was viable. “You have to make sure your local government is going to allow you to run it,” says Bates. That includes making sure the area is zoned to allow such an attrac­tion and reviewing the safety aspects of the site itself. “You have to make sure your building is up to code,” he says. And, if it’s a historical site, like Pennhurst, then the haunter needs to be clear on what he can and can’t do with the physical space. Although a historical structure, Pennhurst was in such disrepair that the government didn’t care what Bates and his team did to it. “The local government was just happy seeing us do any kind of renovations.” That said, Bates says that Pennhurst’s old administra­tion building is a really interesting space on its own, with 12-foot high ceilings and interesting architectural details. So they tried to incorporate some of the existing features into the Pennhurst Asylum, the first Pennhurst event they created. Pennhurst Haunted Attraction first opened with two events in 2010, the Pennhurst Asylum and the Tunnels of Terror and added two more events, the Dungeon of Lost Souls and Ghost Hunt, for the 2011 season. To make that happen on a site that had been locked up and abandoned for more than 20 years took a lot of work. Before Bates could even think about creating his haunted events, fields that were once used by Pennhurst residents for play­ing soccer and baseball and other activities had to be cleared of 20-some years of overgrowth and trees. Then stones had to be laid. The old administration building, now home to the Asylum and the Dungeon of Lost Souls, needed an infrastructure overhaul. The building had had nothing done to it for over 25 years, so there were leaky roofs, backed up septic and water drainage systems, and broken windows. There was also no heat or electric. The first and second floors, which are now home to the Asylum, were divided into 20 rooms that were too small to handle the flow of people Bates anticipated. Walls had to be knocked down to create 16 rooms and allow people to get in and out of rooms with ease. Bates has a pension for detail and for creating realistic experiences in his haunts. And Pennhurst’s other buildings, which were abandoned but not emptied, were ripe with artifacts that have made great props for the Pennhurst Asylum, a mental institu­tion-themed walk-thru event. The Asylum features a psychiatrist’s office that includes images of Rorschach tests on the wall, an evil dentist’s office, and an operating room fashioned with props from the Pennhurst’s hospital, including an operating table, huge lights, and metal cabinets. “There was a two drawer morgue in the hospital, and we disassembled that and reinstalled it in the Asylum to create a morgue,” says Bates, admitting that doing so was a bit creepy. Even though Bates and his team use objects from the days when Pennhurst was an active, functioning facility, they purposely do not incorporate any character, scene, or storyline that has anything to do with or could be interpreted as having to with the original Pennhurst; the people who worked and lived there; and events that may have taken place. Bates and his partners make it clear to their actors that they are portraying something completely fictitious, he says. Bates and his partners reserve the telling of the real stories of Pennhurst for a small museum of hundreds of photo­graphs that patrons have to pass by as they’re going through the queue to get in. “You never hear the good stories of Pennhurst, but there are a lot of them,” says Bates. Through the photographs, visitors can see the activities that resi­dents participated in, including baseball teams, softball teams, Boy Scouts, and a lot of arts and crafts classes. The Dungeon of Lost Souls attraction is in the basement of the administration building. It is designed like a traditional-style haunted house with wall panels, illusions, computer generated special effects, and objects from other areas of Pennhurst. Visitors walk through a labyrinth of cells featuring evil medi­cal experiments that have gone terribly wrong. “One thing that’s pretty interest­ing is that we hired several art teachers, who had the summer off from school. They worked all summer creating the dungeon,” says Bates. The artwork in the dungeon is one of the highlights of the space, he says. The Tunnel of Terror is a 900-foot long gauntlet underneath the old administra­tion building, and it is here that visitors seem to have the most scares. Bates attributes their reaction to several fac­tors. The tunnels, he says, are kind of dark and the space is tighter, so it can feel a bit claustrophobic. It also produces a lot crazy echoes. “There are skeletons and bodies all over the place. There are actors that can pop out in a lot of different loca­tions, including overhead,” Bates says. His team also uses a lot of fog to obscure the view. “Actors can just appear out of the fog, almost right in front of your face. They’re also in closer proximity to you than in the other attractions,” Bates explains. 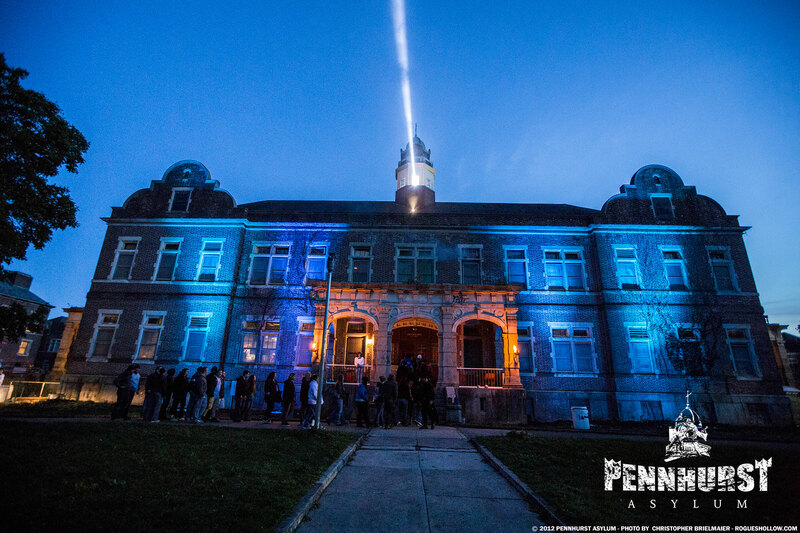 To appeal to patrons with an interest in seeing more of Pennhurst and to those interested in the paranormal, Pennhurst Haunted Attractions opened the Mayflower building, a Pennhurst dormitory, as its fourth event: Ghost Hunt. Like the administration building, the Mayflower needed electricity, proper safety equipment, fire alarms, back-up lights, etc. After getting the building up to code and doing a little bit of clean up, they opened the building up for tours with everything else as is: with peeling old paint, broken windows, and old beds, wheelchairs and other objects. “We turn out the lights and allow people to walk through it with just a flashlight to see what it was like when it was abandoned,” says Bates. According to paranormal experts, like the Ghost Adventure Crew, who have investigated Pennhurst, the Mayflower has some of the most hotspots for encountering the paranormal. While Bates says has never encountered any sort of paranormal activity in the May­flower or anywhere at Pennhurst, he says that almost everyone who has worked full time on the Pennhurst Attraction has either heard noises or seen things. “One fellow that has worked there for the past two years was working in the Mayflower one day this past August and just dropped his tools, ran out of the building, got in his car and left and didn’t come back for three days,” says Bates. When he returned, he refused to talk about what he heard or saw. “Opening weekend we did have one young lady who had to be escorted back to her vehicle in the parking lot because she got so upset. She swears that she saw a ghost,” says Bates, who now has a collection of stories of staff and visitors’ encounters. “We had a reporter who came through— there were two of them, the reporter and his friend—and they were walking through the Ghost Hunt and the friend said, ‘I really feel weird right now.’ The reporter took out his cell phone and took a picture of him, and in the picture there’s a little white wisp that looks like someone is holding his hand.” Not everyone buys into the paranormal and so they don’t take the walk through too seriously. This type of visitor may talk and laugh as they walk through. “Typically, when people come to a haunted attraction they want to come out and get scared by that, so the traditional haunted attraction customer may not have as much fun at Ghost Hunt, because they’re not getting a shot of adrenaline and getting scared,” Bates says. Bates says creating an event today is not like it was 20 years ago. There’s a lot more competition out there and that competi­tion has raised the quality of events over all. “Twenty years ago you could have started out small scale and over the years worked your way through it. Now if you’re going to open a haunted attraction, you need to spend a lot of money, need a lot of quality props and actors, and do a lot of advertising if you’re going to be successful. Pennhurst, just two years old, employs 180-190 people—actors, ticket tak­ers, security, parking, etc.--when it’s up and running. “About half are actors—80-90, of which, at any given time there are probably about 75 working,” says Bates. To be successful, Bates says it’s critical to update at least 25% of the event each year. “I think it’s really important to change things and make them better every year. It keeps your show fresh.” Since Bates and his team added two new attractions to Pennhurst last year, they didn’t change much in the Asylum. So for next season, that’s where they will focus their attention. “We’re going to make more modifications to the Asylum and the Tunnels,” says Bates. His team is also debating whether to open another building for a larger museum and gift shop as well as whether to charge a separate fee for the museum. Some people, Bates says, are simply interested in Pennhurst and its history and may want to come by just for that. 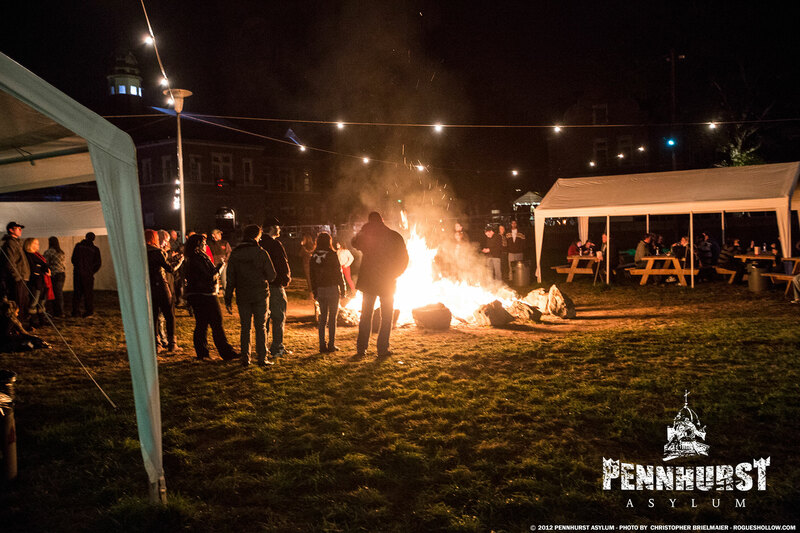 The additions and upgrades Bates and his team plan are only part of Pennhurst’s success. Marketing, publishing, and a dynamite leadership team and staff are also key components. 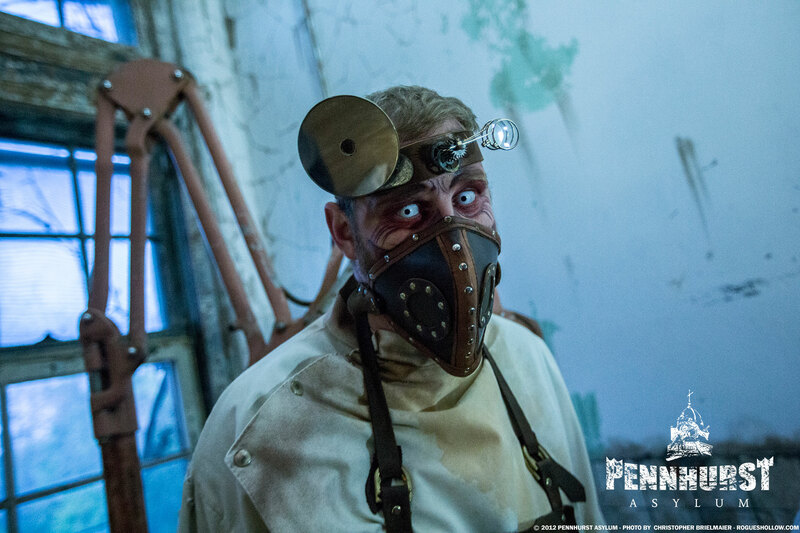 For Pennhurst’s first year, Bates and his team printed and distributed over 1 million coupons. And for year two, they worked at keep­ing their name top of mind by inviting hosts of ghost hunter TV shows, like American Haunts and Ghost Hunters, to search for paranormal activities and film future episodes. The results of their efforts again paid off: Last year on Hal­loween night Ghost Hunters broadcast live from Pennhurst. At Pennhurst, Randy and his team have given an old facility a new lease on life, or maybe the afterlife, their hard work and determination has created an amazing haunted attraction that should be on everyone’s must see list!